What's the difference between UVA & UVB rays? UV is a form of radiation emitted from the sun and it's invisible to the naked eye. It's usually divided into three groups A,B & C.
UVA is linked to cell ageing and long term skin damage and is implicated in some skin cancers but thought not to be as harmful as UVB. 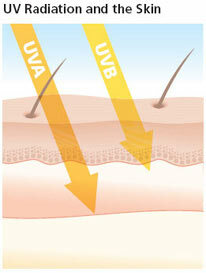 UVB causes sunburn and direct damage to our cells' DNA and is thought to cause most types of skin cancer. UVC does not penetrate our atmosphere much and is low risk. Whilst short term exposure to UV causes sunburn and tanning, long term leads to loss of skin elasticity, discolouration and pre-cancerous conditions such as solar keratosis as well as skin cancer. When choosing your sunscreen please make sure it's a broad spectrum sunscreen as this will offer both UVA & UVB protection.